An excerpt from the Finance Magnates Intelligence Report Q2 2016 regarding the development of fintech in China. This article was written by Amit Ben-Yehoshua, senior counsel at the Shanghai branch of Dentons and arbitrator for China’s largest international arbitration commission – CIETAC. The Chinese economy has been undergoing far-reaching changes recently, trying to build future power based on the services sector. Therefore, more and more is being said about investment in innovation – especially in the financial technology (fintech) niche. In the case of the Middle Kingdom, the main representatives of the industry are companies associated with payments, big data analysis, cyber security, platforms and applications directed to entities representing the financial world. Between the terms ‘innovation’ and ‘fintech’ we could put an equals sign. China depends on innovation and the Chinese government is no longer interested in keeping the reputation of the global manufacturer of clothing and toys. Instead, the second largest world economy wants to move in the direction of modern technologies and solutions. The answer to those needs should come with the Five Year Plan for 2016-2020, which refers to the urge of regulating and promoting innovation in the world of finance in order to accelerate the growth of the most promising sectors of the modern economy – such as peer to peer (P2P) lending and crowdfunding. In China, a careful review of the Five Year Plan is a vital tool to better understand China’s economic roadmap. In a country which mainly functions under single party leadership, the Five Year Plan can help wary investors foresee which road the country is heading towards. According to data provided by the Citigroup, investments in private fintech companies increased tenfold in the last 5 years. China again stands at the front here, being the largest player in the social loans industry – its value in the Middle Kingdom reaches almost $68 billion. 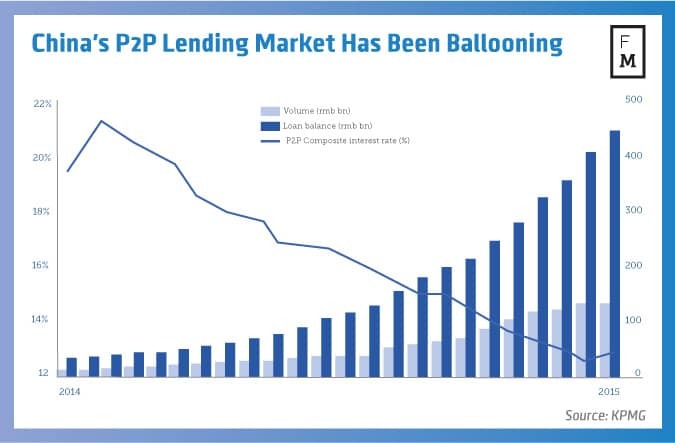 The US P2P lending market, which occupies second place, generates ‘only\ $16.6 billion per year. To realize how powerful the transformation process that Chinese peer to peer loans are going through is, we should take a look at the results of the largest internet lending platforms. For example, Lu.com has over 23 million users with nearly $2.40 billion on their accounts. However, this has its cause. We need to remember that in the case of Chinese SMEs, attempts to obtain a loan or credit are extremely complex and hard. 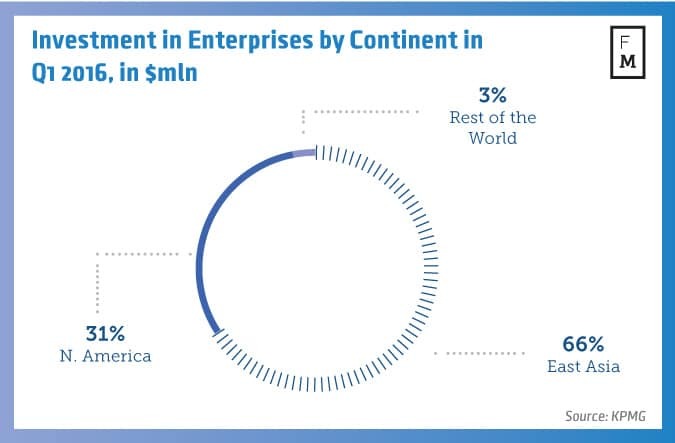 When the small and medium-sized enterprises represents 80% of the market output, only 20% of them obtain bank-provided loans. Until now, P2P market in China has remained unregulated, leading to a series of abuses and huge losses generated by the social loans platforms. The legal image has begun to change however – in June 2016 the Standing Committee debated the proposal to introduce the Network Security Law in order to increase the safety of the users themselves, as well as to improve the quality of services within the fintech industry. On the one hand, China wants to promote innovation, on the other there are many concerns about national security and third-party access to the internal data. 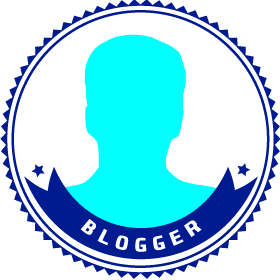 The golden mean here could be the creation of a Fintech Facilitation Office, which would aim to create a fintech ecosystem in Hong Kong for the exchange of ideas between the key stakeholders. The lack of serious regulation has allowed the dynamic growth of the local P2P market, but on the other hand it has caused a lot of abuse. The Chinese government therefore urges the finding of solutions that will allow further growth, while limiting illegal practices. As is well known, the Middle Kingdom has the ability to react very aggressively on financial crimes and impose sever prison sentences. But one thing is certain. 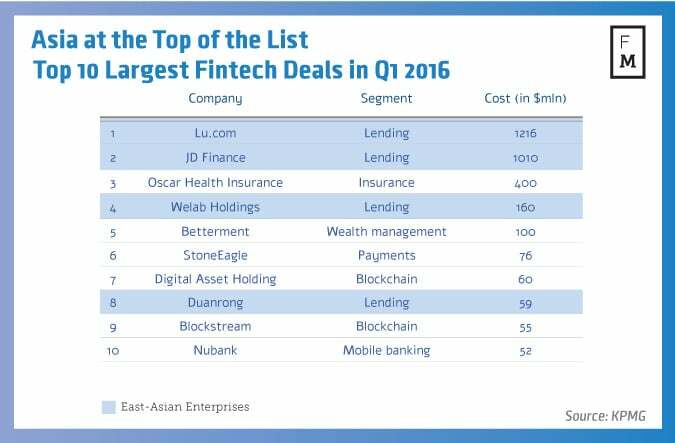 At this point, China has the market and technological capability to become a center of the world’s fintech industry. With P2P loans giants, this new branch of the economy should develop dynamically, allowing the Middle Kingdom to take a step into the global innovation salons.